Announcement Learn to weave. New curated yarn sampler packs! 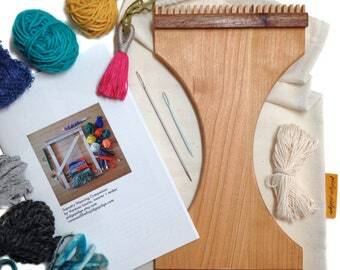 Tapestry Weaving Companion workbooks, 3 deluxe weaving loom kits, heddle bars, wooden needles, naturally dyed yarn samplers, + warping cotton. All handwoven scarves, key fobs, pendant necklaces, clutches, tapestries + other woven accessories are modern, one of a kind designs in joyful, unexpected color combinations. Handmade in Buffalo, NY USA. Every piece is handmade and one of a kind. When you invest in a handwoven scarf, you are choosing a high quality textile that has been thoughtfully designed and created each step of the way. From warping & dressing the loom to weaving and hand sewing hems, every inch of every thread has been expertly handled many times to craft a beautiful garment or piece of cloth. 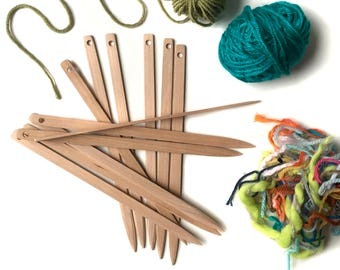 I hope that the detailed + meditative process shines through; handwoven pidge pidge accessories truly are art you can wear! ❖Email subscribers get the first peek at shop updates, new product releases, behind the scenes in the studio, upcoming craft shows + exclusive coupon codes! Plus, FREE downloadable iPhone wallpaper when you subscribe. 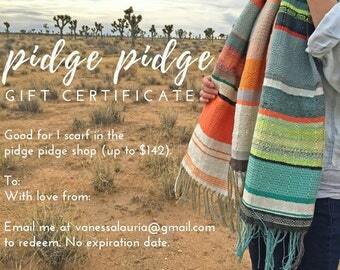 Keep your phone warm + cozy in a virtual pidge pidge scarf! ❖ Can't decide? Love a scarf that has already found an owner? Email me for information about custom scarf color combinations and gift certificates. ❖ Bride to be? 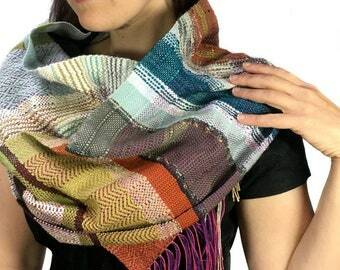 Check out our handwoven scarf collections which can double as shawls (or we can design custom scarves to compliment your color scheme) for your best friends + closest family - your bridesmaids! Registries available on Etsy. ❖ Pet friendly notice: pidge pidge shares some studio space with my weaving mascot, Pigeon the cat. Please keep in mind when purchasing. All items are stored out of Pidge's reach. She hides most of the time anyways! ✜ Copyright: All designs, images, products + copy are all copyrighted and are my personal property. Please contact me if you'd like to use my images in your blog or elsewhere. Learn to weave. New curated yarn sampler packs! 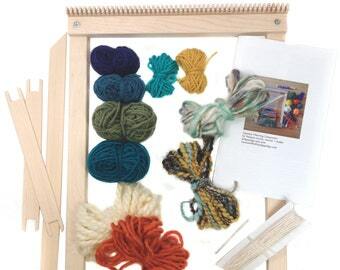 Tapestry Weaving Companion workbooks, 3 deluxe weaving loom kits, heddle bars, wooden needles, naturally dyed yarn samplers, + warping cotton. All handwoven scarves, key fobs, pendant necklaces, clutches, tapestries + other woven accessories are modern, one of a kind designs in joyful, unexpected color combinations. Handmade in Buffalo, NY USA. A beautiful reminder of the mountains I have already climbed and those ahead. The tapestry is so well done - and the colors are grand. It was shipped very quickly. Communication with the seller was kind and friendly. Thank you. Pop over to @hellopidgepidge_sale on Instagram for a weekend sample sale today thru Monday, Dec. 11th. These items have never been on etsy (but some might be listed here after the sale!). Pendants on sale! 10% off pendant necklaces. The gift of handwoven in a sweet lil parcel. My Leclerc loom is always parked in front of a window for ample natural light and lots of birdwatching opportunities. Woven swatches ready for the sewing machine. These quick flurries of color are my fiber sketchbook. Scarves on display at a local craft show. Sharing my work with shoppers, crafters and makers is my favorite part! 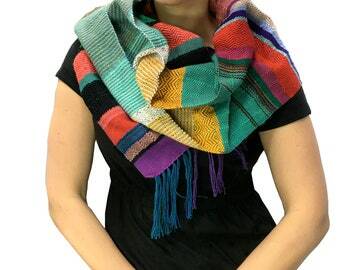 I design and make handwoven scarves in funky, unexpected color combinations. Art you can wear! 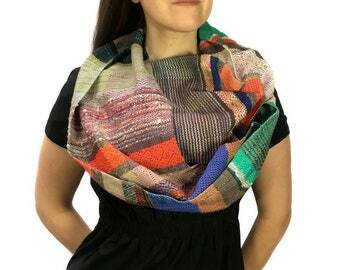 I weave modern scarves that merge the craft of traditional weaving with a passion for modern color and texture. Every scarf is handwoven using a slow, detail oriented process taking about 8 hours to complete. These luxurious handwoven beauties are crafted with a variety of fibers including organic cotton, merino wools and hand spun yarn. I'm influenced by my surroundings, paintings, patterns in nature, fashion, and home decor; they all have potential design inspiration. No two scarves are the same! 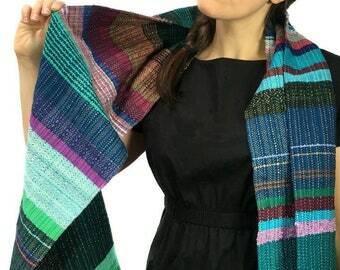 I discovered weaving in college and spent the summer after graduation in the studio, weaving for hours every day. I thank my fibers teacher and mentor for giving me the freedom to explore my craft and go wild with color. For five years after graduation, I worked an assortment of jobs to fund my passion for weaving. After helping a friend at a Renegade Craft Fair, I came home with new friends, business connections and loads of colorful inspiration. I took the leap and began pidge pidge in 2008. 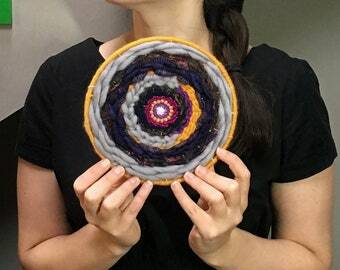 I'm always excited to experiment with unique fibers and play with unexpected color combinations. Looking forward, I'd love to learn to spin. What an amazing textile adventure that will be! We can be friends on instagram if you'd like more sneak peaks into the studio! 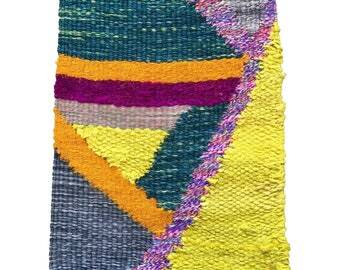 I love to play with color and texture in my weaving and in the kitchen, garden & everywhere in between! I run pidge pidge sandwiched between my loom, a wall of yarn & my trusty sewing machine. My grumpy cat, Pigeon, sits by, overseeing operations! To fulfill your order, you must provide me with certain information (which you authorized Etsy to provide to me), such as your name, email address, postal address, payment information, + the details of the product that you’re ordering. You may also choose to provide me with additional personal information (for a custom scarf order, for example), if you contact me directly. I'm not really holding onto your data for a length of time. When you place an order, I use the data you provide me to fulfill your order and ship it out. - Service providers. I don't currently, but if I engage certain trusted third parties to perform functions and provide services to my shop, such as delivery companies, I will share your personal information with these third parties, but only to the extent necessary to perform these services. - Object. You can object to (i) my processing of some of your information based on my legitimate interests and (ii) receiving marketing messages from me after providing your express consent to receive them (in my newsletter which you subscribed to: hellopidgepidge.com) . In such cases, I will delete your personal information unless I have compelling and legitimate grounds to continue using that information or if it is needed for legal reasons. For purposes of EU data protection law, I, Vanessa Lauria, am the data controller of your personal information. If you have any questions or concerns, you may contact me at vanessalauria@mail.com. Can't decide? Love a scarf that has already found an owner? No worries; I'm here to help! ❖❖ Contact via email: pidgepidge.etsy [!at] gmail.com or send an etsy convo. ❖❖ All items in the shop were made in a smoke free studio. However, pidge pidge shares some studio space with my weaving mascot, Pigeon the cat. Please keep in mind when purchasing. All items are stored out of Pidge's reach. She hides most of the time anyways! Payment is expected promptly upon purchase. If payment is not made on an order within 3 days, the order will be cancelled, and the item will go back up for sale. ATTENTION NYS SHOPPERS: Sales tax rates differ by country & also by purchase (scarves, clothing less than $110 are exempt from NYS sales tax, not local tax) (other items require both local and state sales tax). Please note, your invoice/payment may have to be adjusted to reflect sales tax. Sorry for any inconvenience. ❖ Domestic orders ship first class USPS mail with tracking. Please contact me if you have special delivery requests for holidays, birthdays, etc. Consider upgrading to priority shipping at checkout or connect w/ me if you'd prefer overnight shipping. ❖ International orders will be sent USPS mail w/o delivery confirmation. Please connect with me if you'd like to upgrade shipping beyond parcel post/first class. ❖ Every so often a package can get stuck in customs. I can keep my fingers crossed but, unfortunately, can't be responsible for these delays. It’s nearly impossible to track a package once it leaves the U.S.A. Packages usually take 2-6 weeks for delivery. I cannot offer refunds at this point. Please contact me within 2 weeks regarding exchanges provided the item hasn't been worn & is within a non-smoking home.